Tell us your tales of Ardrishaig! Pop along to the Steamer Terminal in Ardrishaig on May 8th to tell us your tales of the local community and the Crinan Canal! We’re transforming the historic, disused building known as the ‘Egg Shed’ into a new centre that tells the story of the Crinan Canal and the communities on its banks – and we need your help! Delve into your family archives and share your stories, photos, and memorabilia from days gone by with us at our open day on May 8th. Your tales could become a key part of the Egg Shed and will bring the story of the area to life. 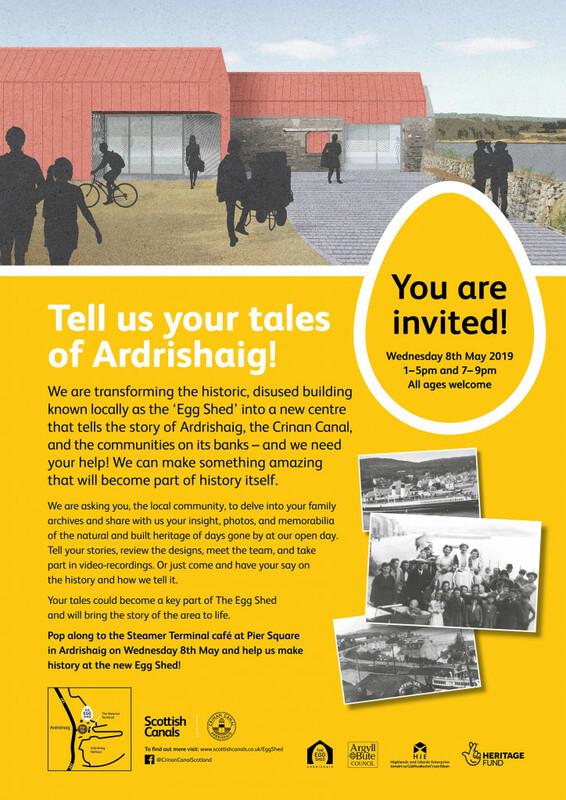 You can review the designs for the Egg Shed, meet our team, share your own tales – or just come along and have your say on the stories of the local community and how we tell them. Pop along to the Steamer Terminal in Ardrishaig on Wednesday 8th May between 1pm and 5pm, and 7pm and 9pm and help us make history! Can’t make it along on the day? You can upload your images, videos and stories at the link below.